This hog is learning how to fly. You must help him in this difficult task! Fly as high as possible and collect as many coins as you can to buy upgrades in the shop. Who has told you that hogs don't fly? There can fly like albatrosses – of course when they have some additional gears! 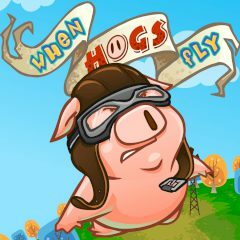 Even a hog can be taught how to fly – of course if you will give him some gear which will help him to stay in the air! In this free online arcade game your task is to launch a fat boar high into the sky and control his flight. Try not to crash into the obstacles and collect coins to buy upgrades in the shop. The higher you fly, the more coins you can get. Are you ready to try yourself in this interesting and funny free action game?